Today, when troubleshooting a failed deployment through a template, I stumbled upon a feature that (in my opinion) deserves a little more love than it has had before. Azure Redeploy is basically intended for use when your VM is in “a bad state”, either caused by trouble on a host, which you don’t control, or when you made a mistake in a network configuration in the VM. When all other troubleshooting angles fail like console view, log studies or powershell remoting, which ever is applicable to your situation, you can use the button with the hammer. 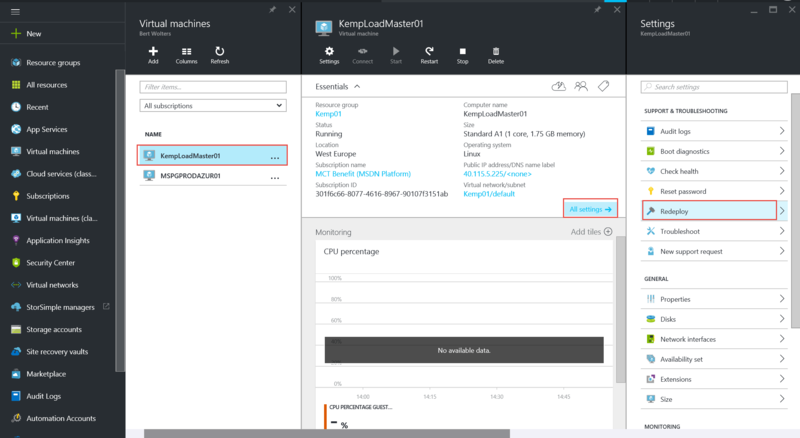 When you “drop the hammer” your virtual machine will temporarily be deleted from the platform and will be rebuilt at another host in Microsoft Azure. This means your tempdrive, since its connected directly to the host it was running on, will be reset. Just as your network configuration. In the end you’ll end up with a new Virtual Machine, based on the VHD of the “old” VM. This will certainly help in some cases where you want to restore services back to normal fast! Want to know more about this great new feature? Watch this weeks’ Tuesdays with Corey.